For the upcoming holiday, I had plans to make one Easter craft – bunny bags. Yet, when finishing up the bags, the wheels in my head started moving. I started to think of more craft ideas that would use the exact same Easter bunny template. That seemed so efficient too – to use the same cute bunny template to make all the Easter crafts. One thing led to another – and I’ve compiled 12 Easter crafts that you can make with this one printable. From Easter decor to kids crafts, they are all here – so is this simple free Easter bunny template. 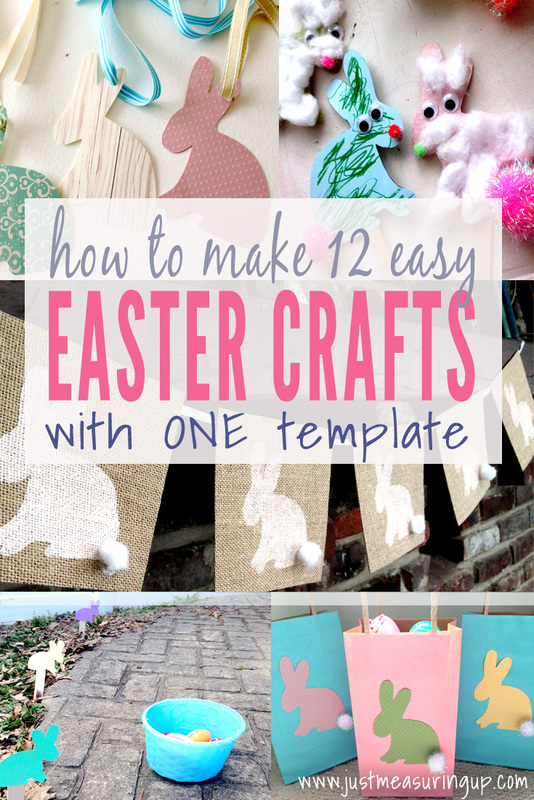 ​Listed below are 12 easy Easter crafts that all use the same free printable bunny template. When we used to have Easter egg hunts at my Grandma’s house, we always needed a place to store the goodies that we found inside the eggs. Our grandma would give us a gallon ziplock bag with our name on it to carry our goodies home. 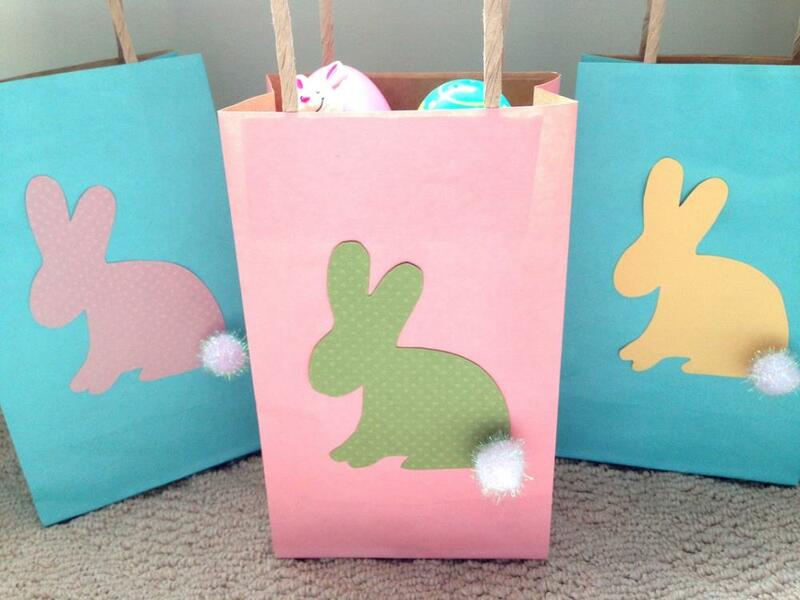 Rather than ziplock bags, how cute would it be to use these cute Easter bunny bags? It’s one of the Easter crafts we are sharing today that take minutes to make and are such a cute touch. This bunny bag could not be simpler. 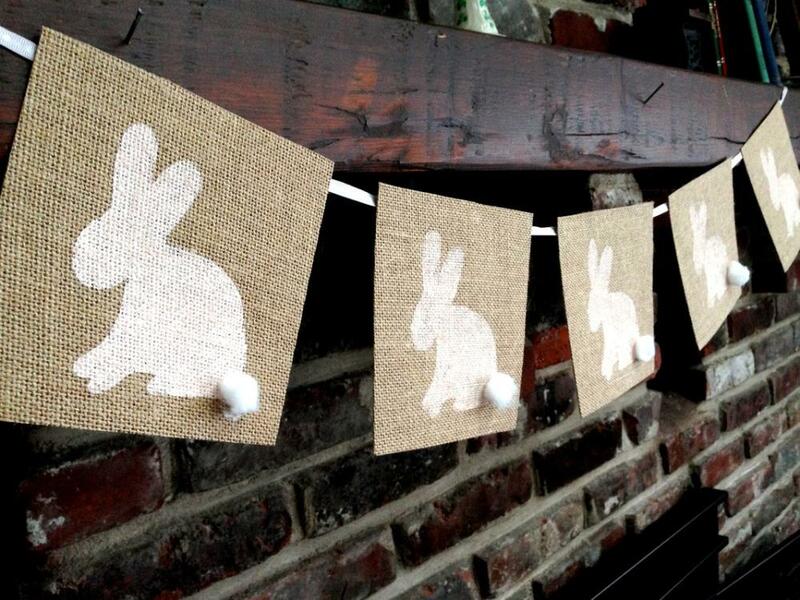 Using card stock or even construction paper, simply trace and cut out the bunnies. Then, glue each bunny to a craft bag. Add a pom-pom or a cotton ball for the tail. As far as the bags and the card stock, you can be as creative as you’d like with this Easter bunny craft. How cute is this burlap banner? I recently posted an article on how to make these burlap banners for St. Patrick’s Day. I loved them so much that I thought a bunny banner Easter decor would be a nice replacement for the shamrocks that had taken stock on our mantel. 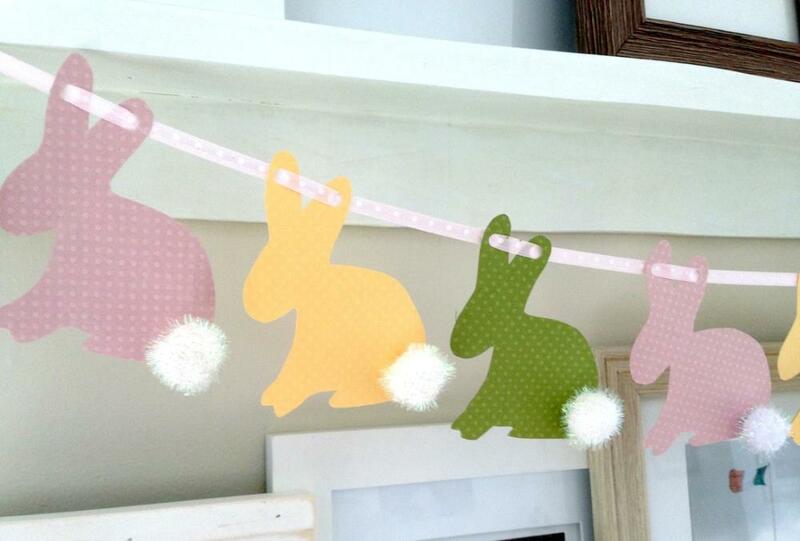 Additionally, the Easter banner garland craft takes under an hour to make – and could not have been easier. ​I love a craft that I have long finished before my son wakes up from his nap. Burlap – I loved using cardboard backed burlap sheets. Since I already posted detailed steps on how to make this banner, I’m going to link over to my burlap banner article. If you are hosting the holiday dinner or looking for an Easter bunny craft, this is a cute one that turns out beautifully, doesn’t break the bank, and won’t use up all your time. Perfect bunny craft for adults. I love having my son make cards for others. I think it instills such a great message to spend time making something special for someone else. 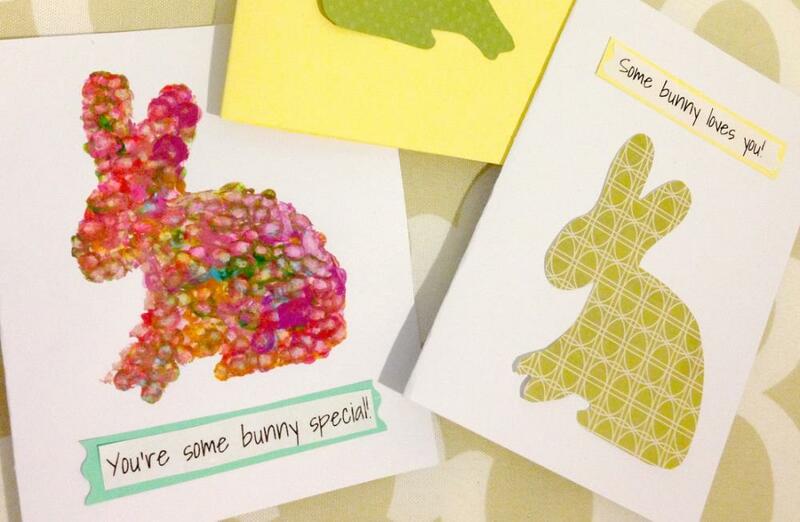 These cards are really easy – they take five minutes and use the same bunny template. You can also make it one of your kids Easter crafts by having your child decorate or color the bunny. You can’t go wrong sending a cute card to someone – and when the Easter bunny craft only takes a few minutes, even better! Easter egg hunts can be a little hard for little kids – especially since they are trying to keep up with the older ones. A simple way to help them find eggs is to put little egg markers, where eggs are hidden for them. Then, explain to the older ones to not find eggs near the egg markers. It also makes for a fun Easter craft. 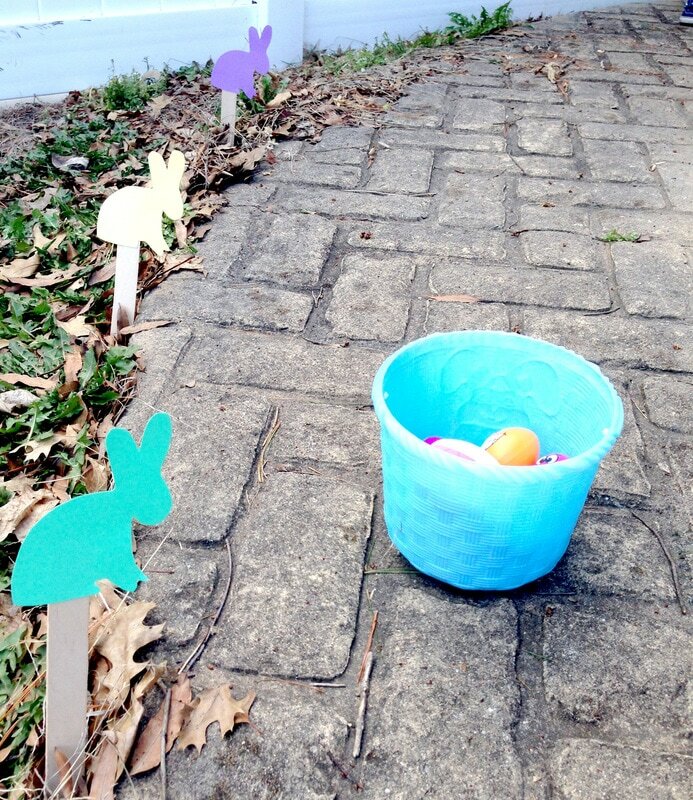 Kids especially can help with this Easter activity because it is so simple. 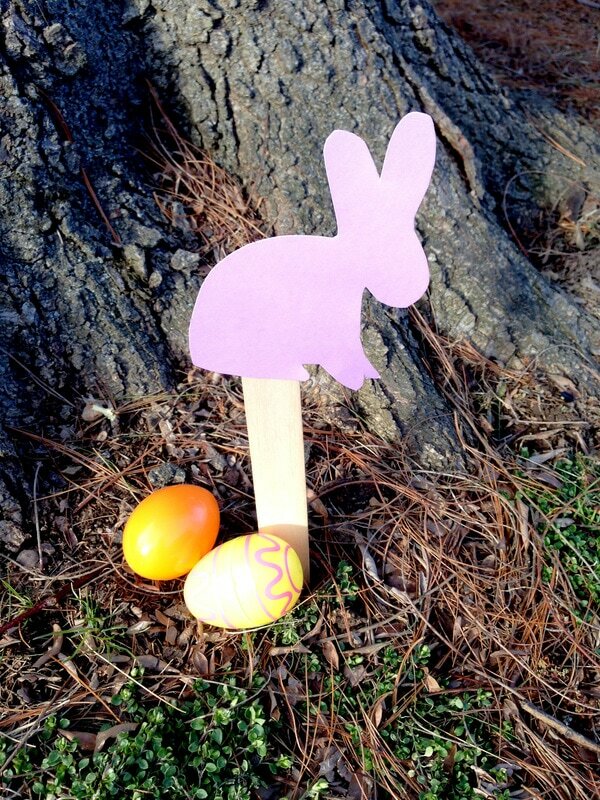 ​Simply glue or tape a bunny template to a popsicle stick and place it in the ground. You could also use the popsicle stick markers to create little signs for the hunt – such as follow the path to the backyard signs or “Bunny Crossing” signs. They are another easy Easter bunny craft that you could do with your kids. 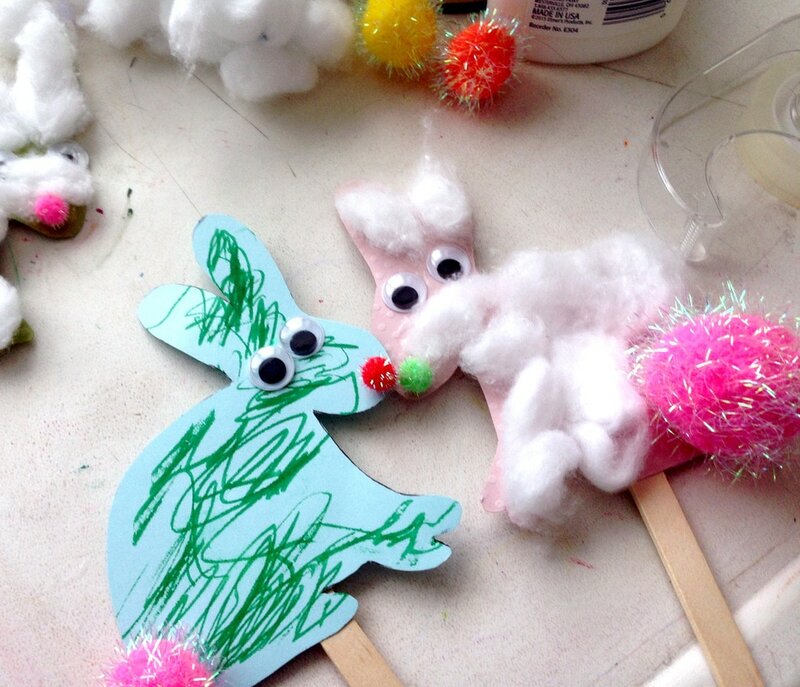 While you have your popsicle sticks out, have your child decorate a few bunny templates as Easter crafts. They could color them, paint them, adorn them with googly eyes or feathers – or whatever you have around your house. After your child has finished decorating their bunnies, simply tape or glue the bunnies to popsicle sticks for kids to play with for a fun Easter craft. ​My son is obsessed with this song “The Finger Family,” and he loved creating a bunny family with these. Another type of banner you could make is a card stock one. The materials are a little easier to gather for this Easter banner craft, rather than the burlap one (although the burlap one is more fun :). 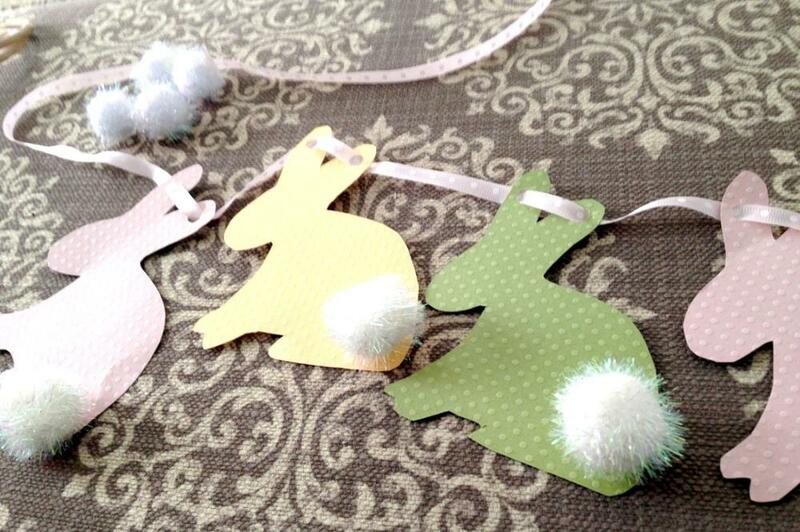 Just trace your bunnies onto card stock, punch holes in their ears, thread onto the ribbon, and glue on the tail. Kids that are older than toddlers, but not old enough to make the banner on their own, could practice their fine motor skills by threading the bunnies onto the ribbon. Another fun decoration and Easter craft for kids to help with is an Easter bunny wreath. It’s one of those Easter crafts that can occupy kids for hours. I cut bunnies out of foam, and then arranged them into a wreath. My son then painted the bunnies – and we hung it up on the wall. 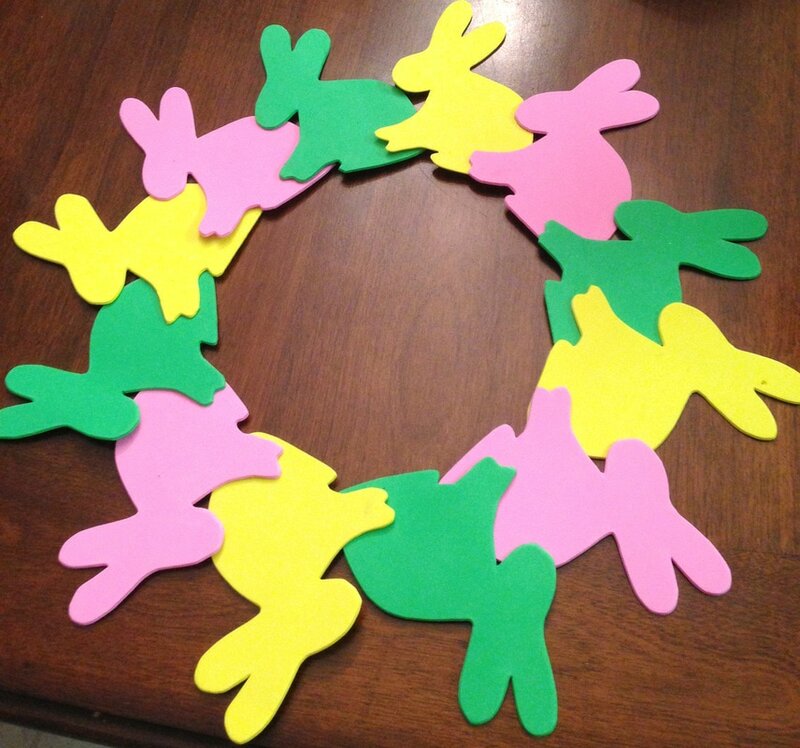 The tricky part of this Easter bunny craft was arranging those bunnies in a perfect circle. So, I used a paper plate. I folded it in half, and then cut a circle from the inside – leaving just a thin outer ring. I then used this ring to line the bunnies up in a perfect circle, carefully gluing the bunnies to each other. Afterward, I had my son go to town decorating the bunnies with paint 🙂 He loved it and painting all of the bunnies, and it kept his attention for a long time. It was definitely a kids’ craft success. 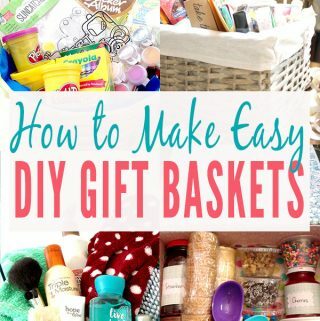 Similar to the bunny bags listed above, glue an Easter bunny from the template to any kind of basket or container, and make a little Easter bunny basket. It’s a simple Easter craft that you can make from anything you have laying around your house. I made this one with a empty plastic cashew container. I was about to toss it in recycling when the idea popped into my head. After washing out the cashew container, I cut and glued my card stock bunny template to the sides of the container. The top edge looked like it needed a little something extra – so I put ribbon about the perimeter. 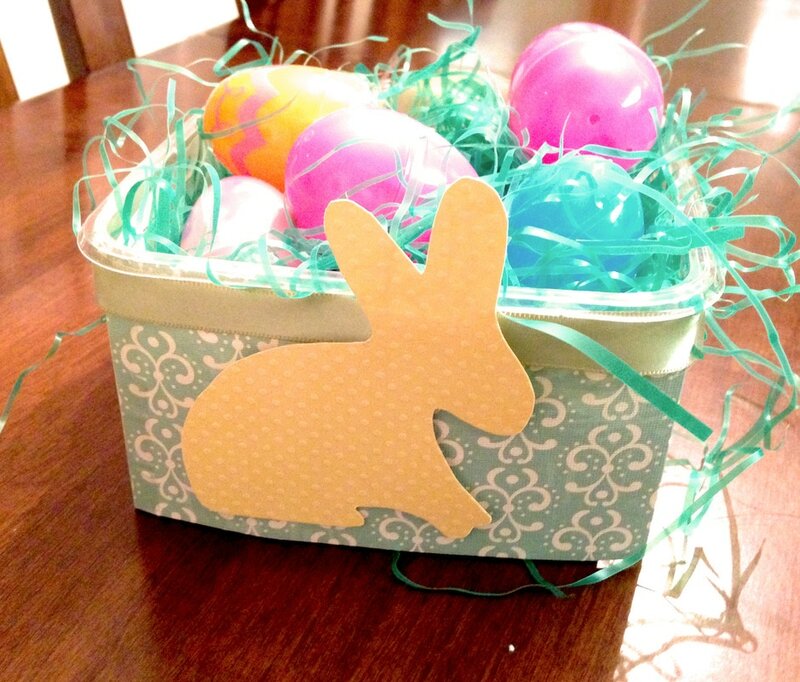 I then glued a bunny to the front, and voila – a recycled Easter basket craft! My number one crafting material is and will always be felt. So, my Easter crafts wouldn’t be complete without incorporating it. My son also loves felt, and I’ve made him a few felt busy boxes. He plays with them during quiet time or even at church when he was younger. The felt scenes occupy him for so long – and allow him to be creative. 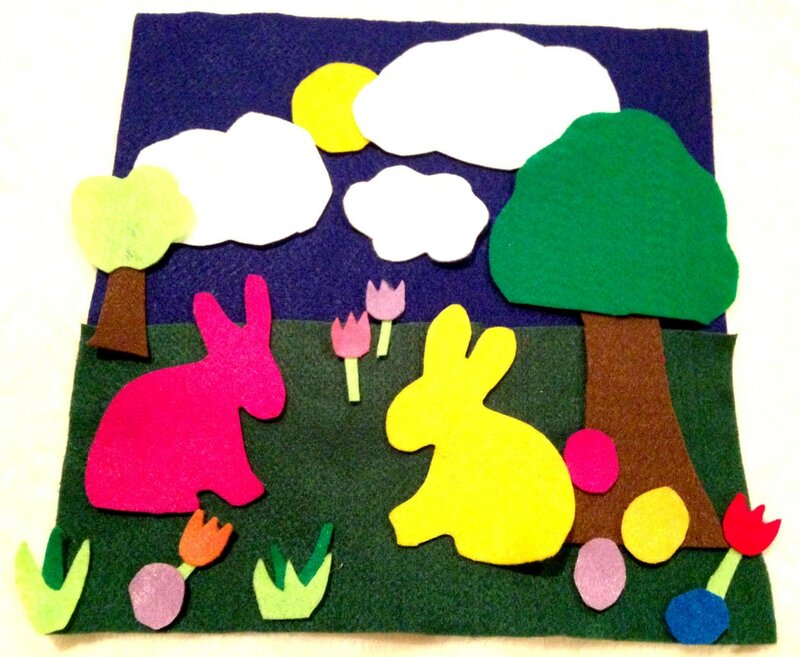 So, why not make a 10-minute felt-scape with a bunny scene? For this Easter bunny craft, first hot glue the background piece of felt to the cardboard or foam. Then, simply cut a few bunnies along with a few other shapes out of felt using the bunny template. Don’t glue anything down but the background, as your child will have fun arranging and re-arranging these into a scene for a fun Easter DIY craft. This one is a simple yet elegant Easter craft. Use the bunny template as tags to label Easter baskets, hostess gifts, or even the bottles of wine you’re bringing to Easter dinner. All you need is the bunny template, a hole punch, ribbon, and a marker. It certainly puts a cute touch on your gifts, turning them into Easter crafts. With all of the food allergies and food preferences out there, I LOVE going to a party and seeing that the food is labeled. You know exactly what’s in something and whether it is for you – or not. If you have a few extra bunnies laying around, simply write the names of your dishes on the cards (this is especially helpful for buffet-style meals), so your guests will be eating at ease. 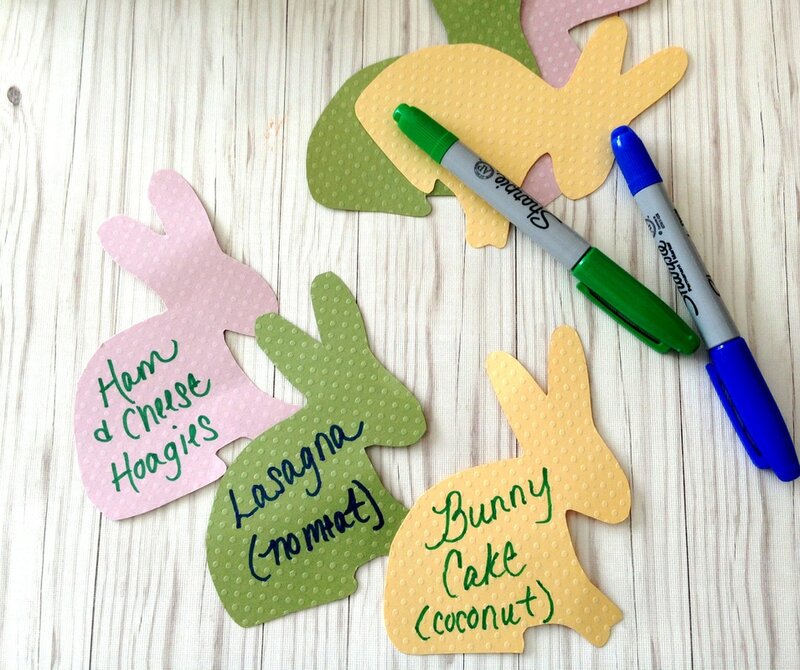 If Easter dinner isn’t a buffet, use the bunny template as place cards – or even have your child decorate them as such. 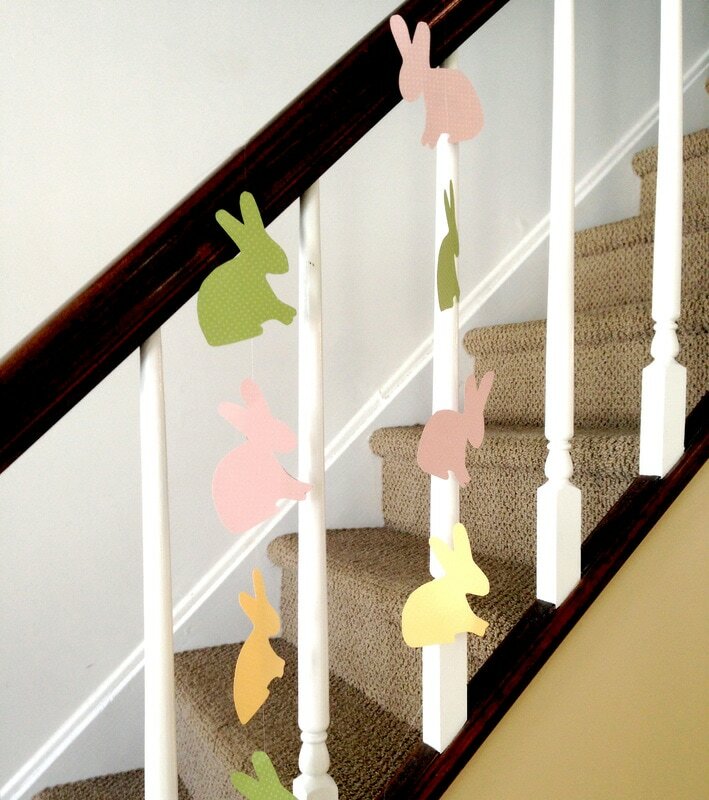 Last but not least, use the bunny template to create bunny garland. This is another quick craft that brings a lot of festivity. 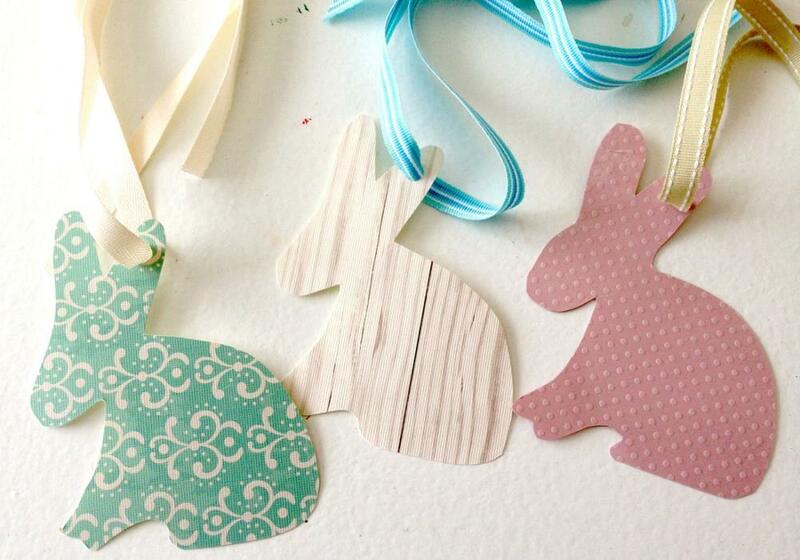 Simply cut out about 6 bunnies for each string of garland using the bunny template. Then use a drop of hot glue or scotch tape to attach the bunny to the fishing line. ​It’s super a simple Easter craft and it turns out cute. 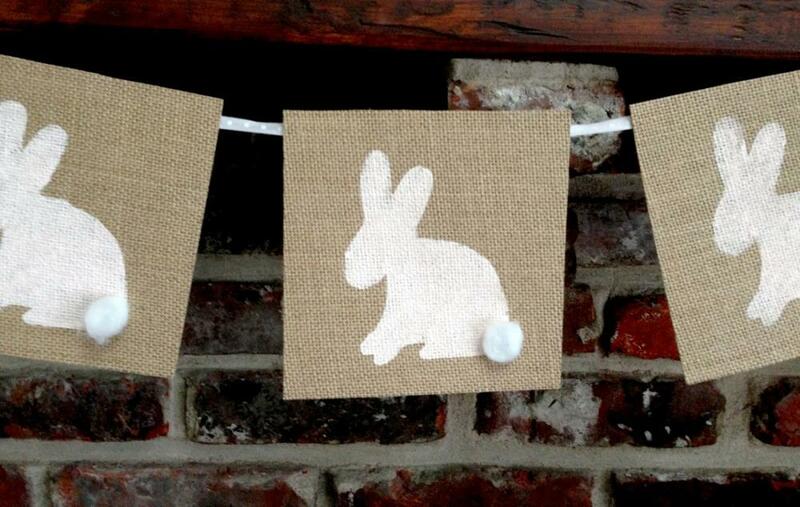 With this easy bunny template, you can create 12 simple Easter crafts. 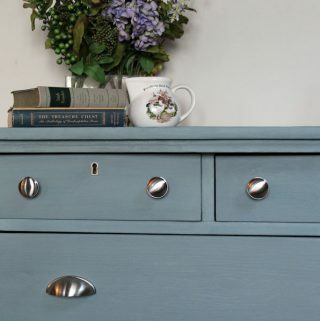 I’ve personally made all of them – and they are simple, easy ideas that are fun and festive. With these simple do-it-yourself Easter crafts and free printable bunny template, you can most certainly bring simple festivity to your Easter holiday. Love these ideas. Adding to my Pinterest queue.I’d love for you to join our link up To Grandmas House We Go.It opens Tuesday nights around 10pm ET. Thanks Stephanie! We appreciate the pin :)) We link up there every week – thanks! What a sweet idea. I love all of the projects you were able to do using the one template. Thanks Debra! I love efficiency 🙂 Have a great week! Thanks so much, Kate!! 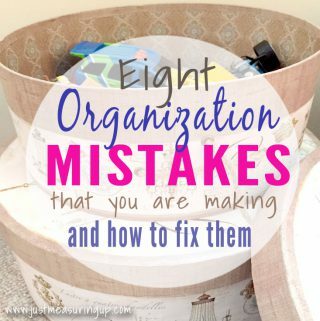 I agree – too hard and too messy are not for me! Have a great week! You sure made a lot of projects from one bunny template. Great to see. Thank you for sharing. Thanks Barbara! Once the wheels start spinning… lol Have a great week! What 1 nice idea. So many projects from 1 template. Thanks for sharing. These are all such cute ideas! Thanks for sharing on the This is How We Roll link up. I love being able to use the same product multiple ways! (Even posted something to a similar effect today.) Your projects are all adorable. I’m not sure I can pick a favorite! Thanks so much for sharing at the #happynowlinkup! What an awesome ideas! Thanks for sharing. you are so creative! one bunny template and so many ways to use it! Thanks for sharing this great craft with us at Thinking Outside the Pot. Love it! This is absolutely adorable. Not one or two but 12 cute ideas with Bunnies! Pinning! So many great projects! I’m goinf to let the kids pick one each. Thank you! Aww that’s a great idea Amanda! So clever and creative of you vary the crafts using the one template! I love it! Great use of a template! Love all the various ideas. Visiting from Really Crafty Party. I cannot wait until Ben is old enough to understand egg hunts! I have so much I want to do and I just cant wait!!!!! Great ideas. I have a bunny Sizzix die that is perfect for some of these. Thank you for sharing at The Really Crafty Link Party. Pinned! Wow, who knew you could so many different crafts from one template! I love them all, pinning for later. Cute and Clever! Love it when we can put a good thing to multiple uses. I am tucking away a few of these ideas for my grandchildren this Easter. So many great ideas! Thanks for sharing at the To Grandma’s House We Go DIY, crafts, recipes and more link party. Hope to see you next week! Very cute idea! Thanks for sharing at Party in Your PJs! I signed up for the DIY e-mails and your page said there would be a link to the bunny pattern, but I can’t find it. HELP I really want to make some Easter things, and time is of the essence here.